On the other hand, flatMap transform operation is a one-to-many. For example, if we call lines.flatMap(x => x.split(' '), flatMap will create a new RDD with 6 records as shown below because it splits records with space into separate words. flatMap can be used for one-to-one as well as one-to-zero mapping as well. For example, lines.flatMap(x => None) will return an empty RDD because flatMap does not create a record in the resulting RDD for None values. Sometimes we may need to split a Key-Value RDD. There is a convenient method flatMapValues which can be used to split a Key-Value pair into multiple Key-Value pairs. For example, calling flatMapValues(x => x.split(' ')) in the diagram shown below creates 6 records in the resulting RDD. Notice that split values in the resultant RDD have the same key if they were from the same Key-Value pair. With this knowledge, we can jump into the example which uses the flatMapValues transform operation to list action movies from the MovieLens dataset. As we did in the previous articles, we are going to use the same MovieLens dataset we used in the first article: Spark 01: Movie Rating Counter. If you don't have the dataset, please follow the first article and download the dataset. The MovieLens dataset has a movies.csv file which contains genres of each movie. The following table shows a sample dataset with rows extracted from the movies.csv file. As you can see, the genres column contains all genres of a movie separated by a pipe ( | ) character. In the following example, we are going to list all action movies on the console. Create a new Scala → sbt project in IntelliJ IDEA with a name ActionMovies and add the following dependencies to the build.sbt file. 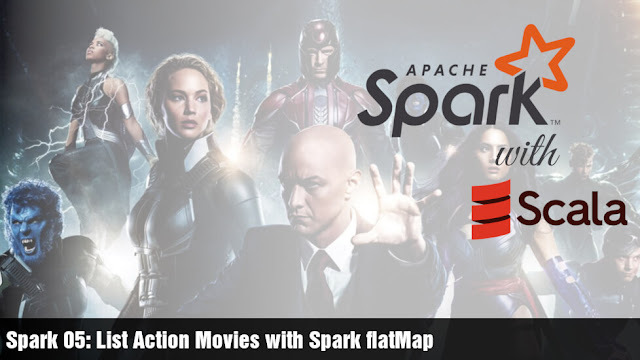 Create a new package com.javahelps.spark and create a new Scala object named ActionMovies. Let's remove the unnecessary movieId column from the record using the map operation. It's time to use the flatMapValues operation. In the following code, I split all values (genres) by the pipe ( | ) character. After the flatMapValues operation, the sample dataset will look like the following table. Notice that now there are duplicate movie names but each (movieName, Genre) pair is unique. After this operation, our sample dataset will have only the Key-Value pairs with a value "Action". In this step, you can simply collect and print the result. However, I prefer to remove the genre from the record and sort the result based on movie names. The following code removes the genre using a map and prints the sorted list of action movies. As you can see all of them are action movies so our code works as expected. You can change the filter function to list any type of movies.